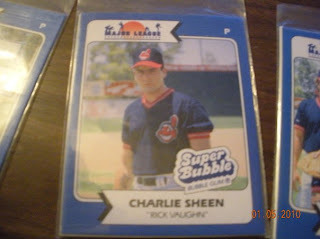 The resurgence of "The Baseball Card Blog" has caused me to stop and think about the future of the Tribecards blog. It is no surprise to many of you who follow this blog that the posts have been scarce in coming for the last few months. Even the annual "12 Days of Christmas" giveaway is now more than 30 days past due. I have been a part of some great and fun things since starting this blog including the giveaways, creating custom cards, various contests, group breaks, etc. While those things have been a blast to be a part of, they all served one ultimate purpose: distraction. I have mulled and milled over the future of Tribecards, even considering closing the doors and leaving this part of my life behind me. The problem is that I have not accomplished the goal I set when I first started writing back in August of 2007. 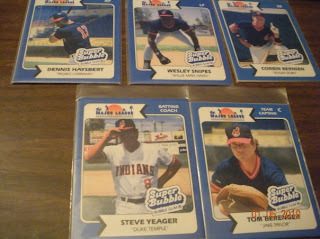 That goal: write about Indians baseball cards. 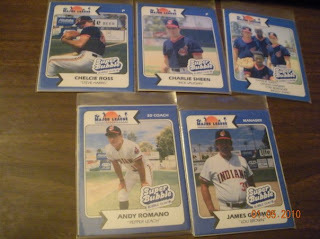 I even named the blog, "Indians Baseball Cards, Always." That was diluted to "...and then some" and that devolved in to "...and Random Wax." In truth, Indians baseball cards (except when posting the great cards people sent me) were being pushed further and further away. I have a serious case of Internet ADD, and that carried over into the arena of card collecting and writing about my Indians collection. As I said, I thought about shutting down and walking away. But, I don't want to. What began to happen in the space between my ears was that coming to my own blog simply reminded me that I had cards to sort through, to package up, and to give away. It was a weight that I feared would crsh me under its weight if I kept coming back. So, I've stayed away. Fortunately, the cure came in the way of an epiphany: The ultimate giveaway. I have a lot of cards I want to sort into teams. And while doing that, I want to give them away to the folks that collect those teams. So, that is what I am going to do. A final giveaway hurrah, if you will. Now, if you already requested a "12 Days" package, you'll be getting cards based on the teams you sent to me. The "12 Days" theme will not be there, however. I will be sending each of you (about 30 folks) a bunch of cards covering as many of the teams you listed as possible. I figure each package will have 100 or so cards in it (give or take). As for anyone/everyone else that wants to take part in this, please send email to davidinark@gmail.com and put "tribecards giveaway" in the subject (so I can find the requests). In the email itself, list 3 baseball teams, 3 football teams, and let me know if you collect something else (non-sport, hockey, basketball, etc). I will build giveaway packages as I go along until all the cards are gone or until the list of people runs out. I do not want this to drag on, so I will wrap up the giveaway by the end of February. On March 01, 2010, all remaining cards not part of my collection will be sent to one person on the list. As the title of Michael Jackson's final song says, "This Is It." 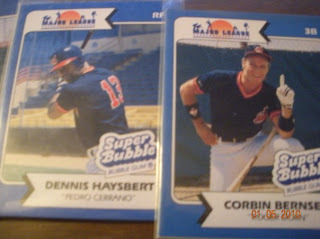 Once this giveaway runs its course, I will be turning my focus back to the purpose I started Tribecards in the first place: to write about Indians baseball cards. That will include things from my personal collection as well as continuing Indians cards checklists and possibly finishing the All-Time Indians by Uniform Number. Thank you for your continued support of Tribecards and for coming by! 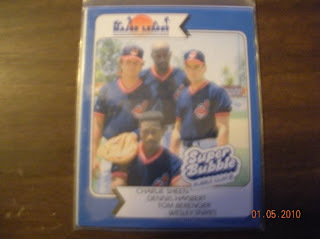 Starting March 01, 2010, Tribecards will once again be about "Indians Baseball cards. Always." First of all, a HUGE thank you to Ryan Dunn of Milwaukee, WI! 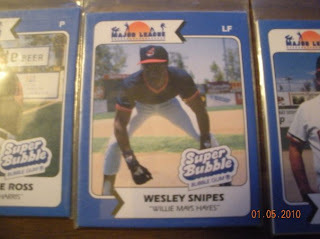 Evidently while doing his own research on the "Major League" movie card set, he came across a post I made last year (here) concerning the legitimacy of the set. I had done some pretty extensive research and only ran into dead ens and "fake" cards. I am reposting them here so I have a copy, too. :-) I have only seen the set listed in ONE baseball card pricing guide ever. I think I may even have it in one of the older guides I own. Heck, I might have even scanned it and posted it here before! I'll have to look and see. If I do have it, I'll be sure to send Ryan a copy of the pricing. THANK YOU so much, Ryan! In one comment, you said you may own the only set in existence at this point. I think you may be right! I even hired a company to look for the set and THEY couldn't find anyone with it!